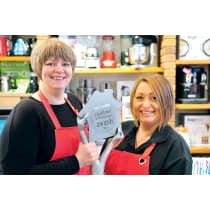 Founded in 1982 by Barry and Hilary Woolston, The Kitchen Shop is a specialist cookware and tableware shop located in the beautiful Cathedral city of Lichfield. This well established shop trades within a three storey Georgian building with a vast selection of cookware on the ground floor and tableware and gifts on the first floor. The founder’s daughters, Vicky and Lizzy run the shop with their friendly and helpful team who are always ready to give expert advice. "With over 35 years experience, we pride ourselves on our extensive selection of products and our excellent customer service. We love our shop today as much as we did when we first opened our doors all those years ago!" Alan Silverwood Ltd Victoria Surprise Cake Pan Set - 8"
Alan Silverwood Ltd Multi Cake Pan - 12"